SAHA - South African History Archive - Ivan Toms speaking at Charles Bester's pre jail vigil while Douglas Torr watches, Johannesburg, Gauteng, December 1988. 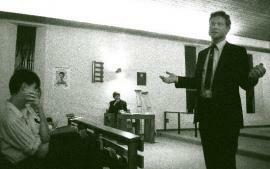 Ivan Toms speaking at Charles Bester's pre jail vigil while Douglas Torr watches, Johannesburg, Gauteng, December 1988. 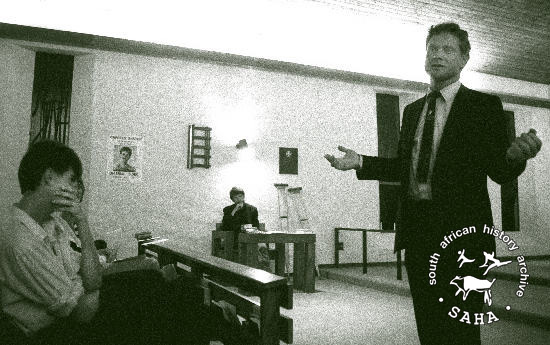 Title: Ivan Toms speaking at Charles Bester's pre jail vigil while Douglas Torr watches, Johannesburg, Gauteng, December 1988. Description: This black and white photograph of Ivan Toms speaking at Charles Bester's pre jail vigil in Johannesburg was taken by Gille de Vlieg in December 1988.